After the two contributions for the collection on RUDI PROTRUDI's FUZZTONES' TRIBUTE VOL. 2 album and LOST-IN-TYME VOL. 4 CD the first Longplayer of these 5 Frenchmen from Paris is released on SOUNDFLAT RECORDS! 14 GaragePunk smashers utterly in the style of THE STAGGERS, THE SATELLITERS, THE CYNICS, THE FUZZTONES & THE CHESTERFIELD KINGS! But the NORVINS aren't second to none of their examples in no way. 12 self composed powerful 60's GaragePunk anthems, which all of them pumpingly but rhythmically go ahead. The choice of the two cover versions 'ABBA' by THE PARAGONS and 'Nothin' by THE UGLY DUCKLINGS completes the album and certifies, that THE NORVINS know, how 60's Garage-Fuzz-Punk is about to be written and performed as well! But also High-Heel Chelsea Boots and the genuine vintaged 60's stage equipment of the band represent, that THE NORVINS have soaked the sound of the 60's cryptic savage bands up like a sponge. Furthermore one or two NUGGETS Comp. LPs are standing in their LP collection or being played over and over again! Together or alternately, guitar and organ are the most impulsive and powerful parts within the ultimative sound of THE NORVINS. Supplemented through drums and bass, this still fresh and young band conjures up a distinctive and inventive R&B-Garage-Punk out of the tubes of their amplifiers. Harp and timbrel are the remaining essentials, played by Ed, the frontman, who establishes this instruments besides his powerful and resonant voice, energetic and blaring. 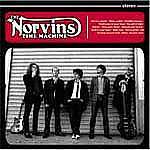 Through Eds doozy verve and through the catchy tune and musical structures THE NORVINS prove their originality, leaned against classic GaragePunk of the 60's. The sound of THE NORVINS is sharper than razor blades and makes sure that your body will start to vibrate and that you will not be able to stop moving because of the right portion of Fuzz linked with the sound of the Farfisa-Organ.